If your opponent Special Summons a Link Monster(s) (except during the Damage Step): You can Special Summon this card from your hand, draw cards equal to the number of Link Monsters your opponent controls +1, then shuffle cards from your hand into the Deck equal to the number of Link Monsters they control. 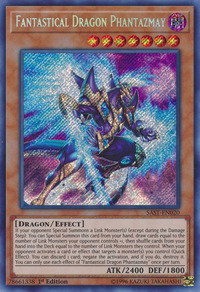 When your opponent activates a card or effect that targets a monster(s) you control (Quick Effect): You can discard 1 card; negate the activation, and if you do, destroy it. You can only use each effect of "Fantastical Dragon Phantazmay" once per turn.